The GEARWRENCH Professional Rechargeable Lighting line from Apex Tool Group was recently updated with 5 new products. The 83139 and 83124 feature a rechargeable lithium-ion battery and USB port while laminating up to 3000 or 1000 lumens respectively. The 83134 and 83135 are ultra-thin flex-head work lights that contain fold-away hooks and magnetic bases. The 83138 features a front-facing dual 500/250 lumen LED and an additional 150 lumen top inspection light. SPARKS, Md., Oct. 29, 2018 /PRNewswire/ -- Creating tools that improve access is a cornerstone of GEARWRENCH®, a premier brand of hand tools and accessories from Apex Tool Group. For professionals working in tight, hard-to-reach spaces, improving accessibility includes improving visibility. 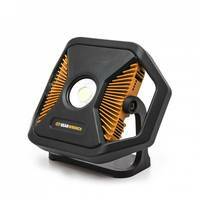 That's why GEARWRENCH continues to add to its line of rechargeable work and area lights. The full line of GEARWRENCH Professional Rechargeable Lighting includes products for every automotive and industrial application. "Whether your job requires area lights, work lights, a headlight, flashlight or penlight, GEARWRENCH has a high-performance, full-featured, professional-grade solution," said GEARWRENCH Senior Product Manager Paul Steinweg. "With output ratings from 30 to 3,000 lumens, all of our professional lighting products are built to last." That line now includes five different lighting options. The 83139 3,000 Lumen Rechargeable Area Light features five levels of illumination ranging from 600 to 3,000 lumens, while the 83124 1,000 Lumen Rechargeable Area Light offers two levels: 500 or 1,000 lumens. Both feature bright and reliable COB technology, a rechargeable lithium-ion battery providing up 10 hours of run time and a USB port for charging other devices. Ultra-Thin Flex-Head Work Lights comes in two sizes: the 83135 500/250 lumen model and the 83134 150/75 lumen model. Both feature fold-away hooks for easy hanging and a strong magnetic base for easy positioning. Last but not least, the 83138 Rechargeable Work Light features a front-facing dual 500/250 lumen LED with COB technology and an additional 150 lumen top inspection light.